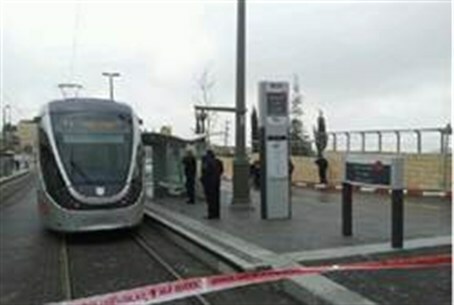 An Israeli female soldier in her early 20s was stabbed while riding on Jerusalem's light rail Thursday morning. The stabber was an Arab who ran away from the scene of the stabbing, witnesses said. The stabbing occurred as the train was traveling through the Pisgat Ze'ev neighborhood in northern Jerusalem. Service has been suspended on trains in the north of the city. Police have opened an investigation. Initial findings show that the Arab boarded the train at one of the stops on its route, quickly stabbed the soldier, and jumped off the train within seconds. After a search of about 20 minutes, police arrested the stabber. He is being questioned by security personnel. Police said that the woman was being treated for serious wounds by rescue personnel, and that she was transferred to Sha'arei Tzedek Hospital for further treatment. This was the first reported terror attack on Jerusalem's light rail, which is ridden daily by thousands of Jerusalem residents, Jewish and Arab. Last week, an IDF soldier was stabbed when soldiers entered the town of Yatta in the southern Hebron Hills in order to arrest a terrorists who was plotting a terror attack. The terrorist, Khaled Mahmara, was released in the deal to free kidnapped IDF soldier Gilad Shalit several months ago. Two terrorists attacked the soldier, and one of them stabbed him in the throat. The soldier managed to shoot the terrorists, eliminating one and injuring the other.